Serve a Healthy Living basil chicken dish at dinnertime tonight! 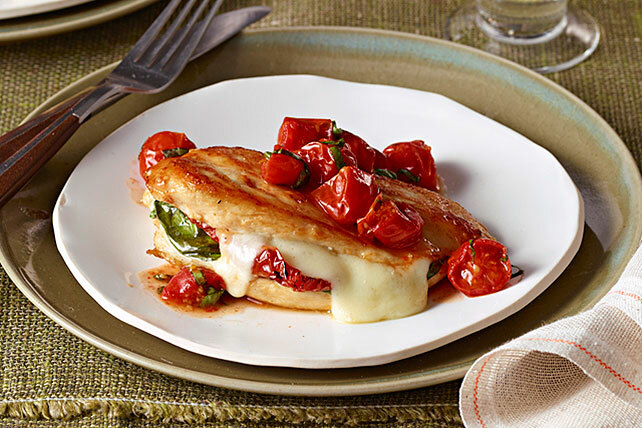 Basil Chicken with Roasted Tomatoes is filled with mozzarella for a melty cheese taste. Make cut in one long side of each chicken breast, being careful to not cut through to opposite side. Fill each pocket with 2 basil leaves and 1 each cheese slice and sun-dried tomato. Place chicken on one side of rimmed baking sheet sprayed with cooking spray; add tomatoes to other side of baking sheet. Brush chicken evenly with 1 Tbsp. dressing. Cut remaining basil leaves into thin slices. Top tomatoes with basil and remaining dressing; toss lightly. Serve chicken topped with tomato mixture.